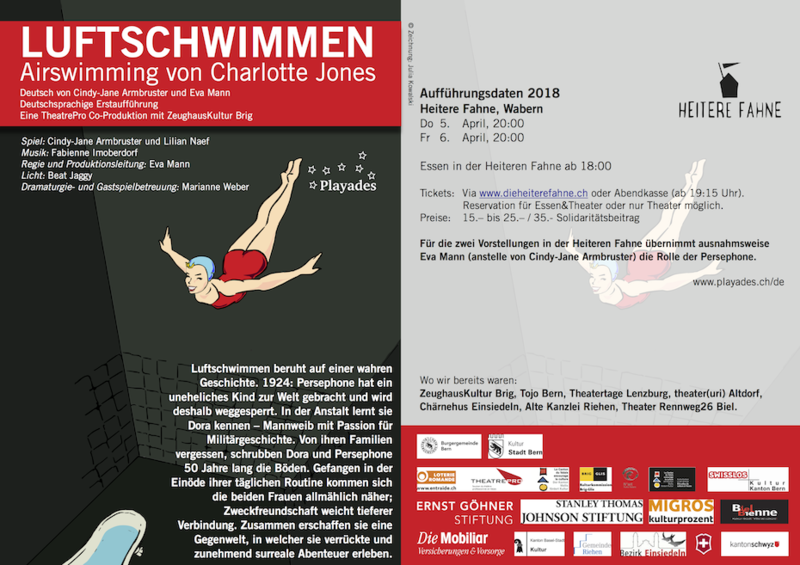 April 2018: Two further performances of Airswimming by Charlotte Jones at the Heitere Fahne in Wabern. We're also working on organising further performances of our staged reading Horu Fröiä. Airswimming by Charlotte Jones is based on a true story. 1920s, St Dymphna's Asylum for the Criminally Insane: Persephone, Daddy's little girl, has given birth to a child out of wedlock, so she's been locked away. At St Dymphna's she meets Dora, a virago with a passion for military history. Dora and Persephone scrub the bathroom floors. For years. For decades. Forgotten by their families, they are not released until some 50 years later. Trapped in the solitude of their daily routine, the two women eventually bond - what is initially a matter of necessity and convenience slowly deepens into genuine friendship and connection. They start sharing stories from their lives, or fragments of stories, since neither has ever been able to fully grasp what happened to her, and why. The narrative is interrupted by the appearance of Dorph and Porph - alter egos of the two captured women - who go on wild and increasingly surreal adventures: airswimming, joining the Red Army's women's battalion, living their lives to a soundtrack of Doris Day. Similar to Beckett's tramps, Dorph and Porph are waiting for an unfathomable, unknowable, eternally absent something, which might be able to offer redemption and meaning. Airswimming is a tragicomedy, an hommage to the many women who were locked up in asylums and prisons for being single mothers or simply not quite fitting in. Persephone: Cindy-Jane Armbruster Eva Mann will be playing the role of Persephone (instead of Cindy-Jane Armbruster) at the two performances at the Heitere Fahne. Enjoy a pre-theatre meal at the Heitere Fahne from 18:00. Tickets can be bought either online Heitere Fahne; or at the door (open from 19:15). Reservation possible for Meal&Play, or just for the play. Eva Mann will be playing the role of Persephone (instead of Cindy-Jane Armbruster) at the two performances at the Heitere Fahne. We're planning more stops on our tour. For updates, please check out our website and sign up to our newsletter (currently only in German).